You may have noticed a great lull in posting in the early part of July. Of the many reasons for that, one was a family trip to Las Cruces, New Mexico last week to visit my parents in-law. During which, a quick trip to the grocery store turned up so New Mexico (New Mexican?) beer finds so let me ramble about them. First up, Marble Brewery IPA. I've had this beer before on prior travels to New Mexico, and me thinks they've tinkered with the recipe. It's much brighter and floral than I recall, with some earthy and pineapple notes thrown into the mix. It seems rather malt forward with a creamy underlying malt base despite the 95 IBU's. Despite its slightly heavy malt character, the hop freshness wins the day to create a brew that did a good job quenching my thirst under the hot New Mexico sun. Then there's the intriguing De La Vega's Pecan Beer. They grow a lot of pecans in New Mexico, so it figures someone would try putting some in a beer. De La Vega basically takes their Amber and adds pecan oils to it. And by golly, it works. It's not the most subtle beer, the pecan nuttiness is pretty front and center but the pecan blends well with the toasty malt. The flavors are clean, the beer is uncluttered, and it all works. Finally, every trip to Las Cruces includes a stop High Desert Brewing. It's interesting to see how the place how evolved over the past nine years since I've been coming here. When I first dropped by, it was a quirky locals joint, featuring one of the finest collections of Velvet Elvis paintings west of the Mississippi back by the restrooms. Then a few years later, the Velvet Elvis's disappeared and the place seemed dominated by a hipster college crowd from nearby New Mexico State University. Just last week, the gentrification of High Desert seemed nearly complete, with trendy art adorning the walls, but the Velvet Elvis painting were back! As for the beer, it was solid as ever. Over onion rings I enjoyed their clear Hefeweizen, with a snappy wheat tang and light clove aromatics. Now a German Brewmaster might rightfully claim this isn't exactly the traditional, cloudy yeasty Hefeweizen we've grown to know and love. I'd have to agree, but the brew still tasted mighty fine. As someone who's run for the last thirty-six years of my life, I didn't need to read Becky Wade's new book "Run the World" to know runners form wonderfully unique communities. But her remarkable book shows just how diverse the strange tribe of runners are throughout the world, all dedicated to the simple act of running. Shortly after finishing her distance running career at Rice University, which included All-American honors and two Olympic qualifying times, Becky Wade was awarded the Thomas J. Watson Fellowship, a one-year fellowship for study outside the United States. Ms. Wade used this to explore the running communities of England, Ireland, Switzerland, Ethiopia, Australia, New Zealand, Sweden, and Finland in the course of a year starting in the middle of 2012. Her book is her story of those travels, followed by a coda of her debut marathon at the 2013 CIM Marathon in Sacramento where she finished in 2:30:48, the third fastest time for any US woman under 25. The success of travelog books like this depend heavily on the strength of the narrator and the good news is that Ms. Wade is an enthusiastic, talented storyteller. 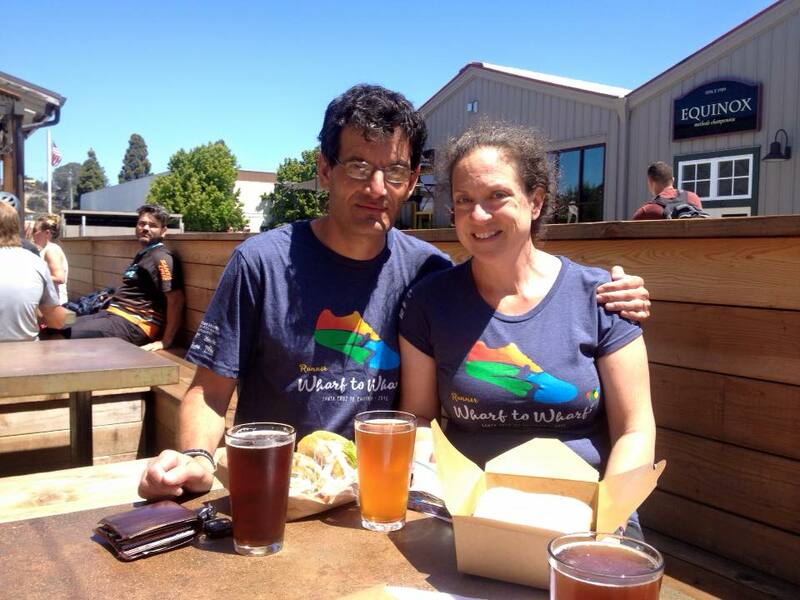 What could have easily been a tedious "bus schedule" of work-outs and weekly events is instead a series of engaging stories of the people and cultures she encounters who share her devotion to running. It helps that Ms. Wade clearly used her elite connections to hook up with numerous running clubs and meet elite athletes, including distance running stars Vivian Cheruiyot and Haile Gebrselassie. A scene with Gebrselassie crazily dancing as he hosts a party is one of the more memorable scenes in the book. Ms. Wade clearly has a knack for adapting and blending in to each new place she visits, enhancing her impressive powers of observation. While the various running clubs and training groups she joins on her worldwide tour include runners of all abilities, the book focusses more on elite runners hard at work pursuing lofty goals than those running for recreation or personal growth. Yet, even within this narrow elite focus, we find there is a wide spectrum of different approaches to running throughout the world. In Ethiopia, Ms. Wade trains with the Ya-Ya Girls, three aspiring young elite women runners who never keep a log, start their runs with no set time or distance, spontaneously running through rugged, high-altitude terrain in whatever direction they feel like. A bad run by one of the Ya-Ya Girls is ominously chalked up to "The Devil was inside of her sapping her strength". Yet in Japan, she encounters a group of elite male marathon runners stoically running lap after tedious lap in small parks at tightly regimented paces and seemingly suicidal training volumes. Somehow through these opposite approaches both the countries Ethiopia and Japan both dominate world class running. The other countries she visits all approach training some where in the middle of these extremes, often reflection the national culture. For example, the Swiss stress more precision in their workouts while the Irish tend to be more freewheeling. What we discover in Ms. Wade's book is that despite all the cultural differences, the hard work of running creates a universal bond and respect within each running community, whether in sprawling European clubs full of runners of all abilities engaging numerous post-run social events, or with the Ethiopian Ya-Ya Girls, cloistered in a small room at the foot of the mountain treating Ms. Wade to a traditional coffee ceremony. Ms. Wade's historic debut marathon to conclude the book has a certain inevitability to it, as if she could not possibly fail to achieve a great marathon performance after cramming so much valuable running experience during her year abroad. 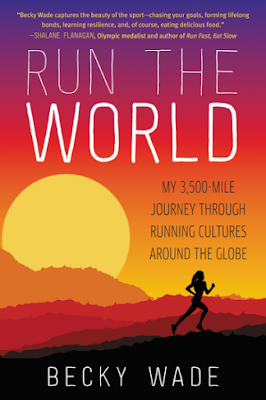 Unfortunately, it's doubtful "Run the World" will find much readership beyond the running community. That's too bad, because it carries a message that seems to be missing as our nation seems increasingly divided. "Run the World" shows while racial and cultural barriers certainly exist, the hard work, patience, and understanding required to achieve a common goal will overcome them. This year? Well, after taking a couple months to recover from a left hip injury from the Napa Valley Marathon, getting sick in mid-June, and various other stuff I won't bore you with that cut way down on my running mileage, I was pretty sure this year's Wharf to Wharf was going to be my slowest ever. Still, you never know what can happen on race day, but starting my warm-up and feeling little strength in my legs, I'm thinking "I've got nothing." Stretching and shaking out my legs in the middle of the Santa Cruz Beach Boardwalk Amusement Park, I begin to feel a little life in the legs, I also chatted with some of my training partners as we stretched, which always gets my mind a little more relaxed and confident. Of course, in some ways showing up for a race no where near your best fitness is sort of a relief: The pressure to run a fast time is off, and if planets all align and you happen to run well, that bodes well for the future. The gun goes off. Walking through the moving crowd as well all approach the starting line, a few second later, enough space forms around me so that I can break into a run. Dodging around the various runners in the crowded field, I come through mile 1 in 6:48. Mile 2 is almost the same pace, at 13:30. From there, just trying to get under 6:40 per mile pace was the goal, but unfortunately that proved to be elusive and by mile 5, it's hard work just to stay under 7:00 pace. I keep at it, striving to pick up my knees up and get my arms moving. Charging down the last down hill quarter mile of the race, I cross the finish line in 40:33, which is 6:45 per mile pace for the six mile distance. The good news is that it was one of the most smartest run, evenly paced runs I've ever done. The bad news my time was nearly four minutes slower than last year. It's hot. Some days with the sun a-blazin', I don't even want to look at an IPA, and instead reach for the lighter summery beer styles. These styles get no respect. They're technically harder to brew than IPA's, Imperial Stouts and other styles that get beer geeks raving, yet the best of them barely earn a ho-hum among the self appointed beer cognoscenti. I've been seeking out more of the lighter, summery thirst quenching brews these days and here are three I particularly liked. First up, Alviso Mills Hefeweizen which San Jose's Santa Clara Valley Brewing just released June 23rd. I find American brewers either hit or miss with this quintessential German style. Some capture all that wonderful yeasty estery goodness in their Hefe, others produce a rather so-so wheat beer. Santa Clara Valley Brewing gets it right. Fruity esters dominate the flavor profile, with maybe a little banana and very slight clove-like aromatics, and it finishes with a satisfying wheat tang. Well done. Just down the road from Santa Clara Valley Brewing, Hermitage Brewing is pouring a mighty fine dry hoped Pilsner in their tap room. While Hermitage is best known for their ales, it's nice to see them getting notice in the cold fermented act. Their Pilsner is crisp, with some spicy floral bitterness and a decent malt heft. Simple and clean like a Pilsner should be. Hermitage Brewmaster Peter Licht spends a minute to describe the new Pilsner release in this video. We now turn to California Dry Hopped Lager from Davis, CA lager specialists, Sudwerk. The guy at the Sudwerk stand at any Bay Area beer festival I've been too is always the loneliest guy in the room. Unfortunately, not a lot of people check out lagers at a beer festival, and so basically the poor Sudwerk guy is there with no nothing to do and no one to talk to. I've even seen tipsy beer hipsters laugh at the Sudwerk stand. Not cool. Those wishing to expand their beer horizons to possibilities of lagers will be rewarded here. There's a light of nice herbal aromas as it pours. This brew has a sturdy malt base, with a snappy grassy and herbal hop finish. A real "stick to your ribs" kind of lager. So Sudwerk, just ignore the douchebag beer hipsters and keep the lager faith.